•Do not walk off trail, stay in the centre of the trail. Do not touch long grasses or plants. 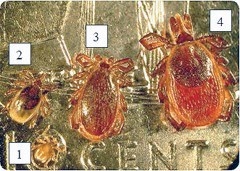 Some ticks can also be found in leaf litter. •Keep dogs on leash and on the trail. This is not only important because of the ticks but because there are a lot of sensitive plant and animal species here in the Rouge as well as ground nesting birds and animals. •Wear light coloured clothes consisting of long pants, long socks and long sleeves. Leggings or tight fitting pants are not recommended; hiking pants or loose legged pants are recommended. Tuck your shirt into your pants, and pull your socks over your pant legs. •When you are finished your hike, check your clothes, hats, shoes, face, hair etc. for ticks. •Check children, dogs, outdoor gear and bags for ticks as well. •If you find an attached tick, remove it with tweezers immediately. Removing it within 24-36 hours can help prevent infection. Follow proper removal procedures. If you do find a tick, remove it following proper guidelines or go to the doctor to remove it. Make sure that you read up on how to properly remove a tick if you do it yourself. Keep the tick in a bottle and send it in to Toronto Health to have it checked for Lyme Disease. Ticks can take up to 24 or 36 hours to "bite" so it is important to shower and wash your clothes as well as do a tick check when you get home. We are not the managers, property owners or operators of Rouge Park. 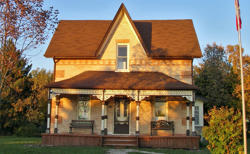 We are a non-profit charity located here in the Rouge. 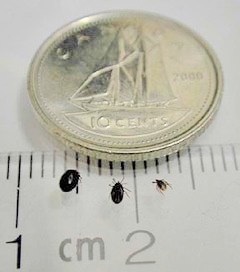 For complaints, concerns and questions about ticks please contact the City of Toronto Parks Department (current Park Managers) or Toronto and Region Conservation Authority (current Property Owners). 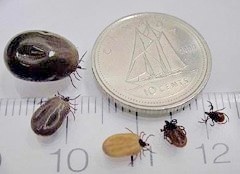 The following photos have been taken from https://www.canada.ca/en/health-canada/services/pest-control-tips/blacklegged-deer-ticks.html and show the Black Legged Tick in different forms.